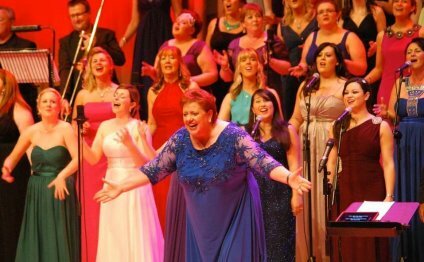 Belfast Community Gospel Choir (BCGC) have taken the province by storm since they formed in 2009. Hailed as 'the soul of Belfast' the choir belts out high energy gospel classics as well as R&B and soul hits. The choir is led by their charismatic founder and director, Marie Lacey, who has been described as a "stand up comedienne, backed by a choir" and Marie fully engages the audience at every event and has been known to even have audience members join the choir on stage! The choir's performances are charged with joy and audiences can be sure of experiencing the feel - good factor through hand-clapping, foot stomping, high energy music.BCGC is made up of 100 members who perform in various sized ensembles - in their entirety as a mass choir, smaller choirs of 30 - 40 singers and vocal groups which are made up of the choir's lead vocalists. Each ensemble delivers the same dynamic sound and energetic, uplifting performance. The choir performed at the opening of Titanic Belfast in March 2012 and were invited back to the Titanic Building to perform for Her Majesty Queen Elizabeth II on her diamond jubilee visit to the province. Belfast Community Gospel Choir "Bridge Over Troubled Water"